Bait Fish: Meal of biger fish! The Maldives is dependant on coral reefs for the maintenance of their land area, food, export earnings and foreign currency from tourism revenues more than any other nation except the countries of Western Pacific. Groupers are vital in maintaining a functioning coral reef ecosystem. What we do know about the current status of groupers, however, is not encouraging. The people of the Maldives have been estimated to have among the highest levels of per-capita fish consumption of any nation, at 125 kilos per person per year. The majority of this consumption is of tuna and other pelagic species, while the main export fisheries are also tuna. Some reef fish are taken for local consumption, but the most important reef fishery is the capture of groupers for export. Fish exports for the live fish markets also started with grouper fisheries to East and Southeast Asia. For more than past 10 years, groupers were an important non- traditional commercial species in the Maldives for export and they are heavily fished. Groupers were so common species in the Maldives a decade ago. The natives of these islands hardly eat them. Some fishermen who were trying to get reef fish other than groupers did consider groupers as a nuisance. They were so common you could always get groupers in reef fishing. When the fishermen found out that groupers were in high demand from lucrative markets in South East Asia, the groupers fishery expanded in an enormous scale. Like the gold rush, there was a wild rush towards this money-making business. 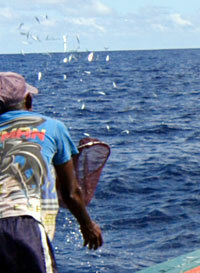 Initially, fishermen got a fraction of a fraction of the real value of the groupers. Middlemen and foreign buyers benefited a lot from the business. Even though it was a fraction that the fishermen received, mosques and schools were built in islands with money generated through groupers fishery. Some islanders even gave up traditional tuna fishery and shifted to the quick bucks from groupers. Groupers fishery are especially vulnerable to over fishing and therefore need special management measures. Groupers come together in large groups, called spawning aggregations, during the full moons, normally between Septembers to November. Local fishermen know the exact time and days when groupers gather for spawning aggregation. The spawning aggregation areas are normally in the same location year after year which makes it easy for fisherman to return to the areas. During these aggregations, the female groupers produce planktonic eggs that are fertilized externally. The fish also take a long time to reach maturity, which means that if a large number of mature adults are fished from the population one year, it will take a long time before the population can return to normal. The size of the population can also be negatively affected if the fish are caught before they have had the chance to spawn. These characteristics combined with the relatively strong demand for groupers in South East Asia suggest that some measures need to be taken to ensure sustainable fishery. Groupers’ main diet include of fish such as parrotfish, wrasses, snappers. Juveniles, on the other hand, eat a diet composed mainly of crustaceans such as crab and shrimp. These juvenile groupers are usually found around coral clumps. Local fishermen are familiar with a more than decade of experience know these cycles and find that the best time to catch this species is when they are in these large spawning groups. This situation is not one that exists just in the Maldives. Groupers in the Caribbean, South Pacific and Indian Ocean are reported to be declining. Some countries have even gone as far as to close this fishery in order to protect them from extinction. . Other countries, have instituted gear restrictions. Many countries have taken a number of measures including establishing marine reserves at some of the spawning aggregations, but due to the continued decline in annual catches, it is clear that additional measures may be needed to protect this species and the fishery that it supports. 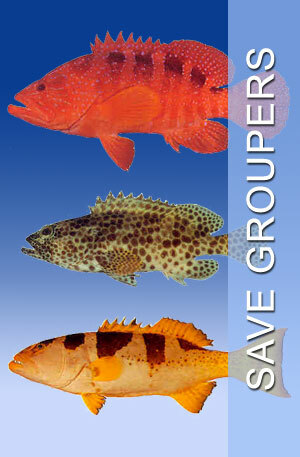 Groupers are very important for the sustainability of a reef ecosystem. In order to sustain the groupers stock, we need urgent actions such as closuring of fishery during the spawning season and imposing an export restriction. Increasing awareness among stakeholders is also vital for management of a sustainable groupers fishery.